Butterfly Bay Hook Island to Cateran Bay - Border Island. Onto your fourth day - and by now you're totally relaxed and ready for more island exploration, continue east along the top of Hook Island there are several anchorages to choose for another snorkel. Maureen’s Cove and Luncheon Bay both have several moorings to pick up map c14/15 where you can again explore the wonders of what is underneath the water. Both are popular dive spots and both have beaches that can be explored. On to Manta Ray Bay map c14/15, only 2 moorings available. Here you can snorkel and see the amazing Maori Wrasse that often pops up to say hello. Motor or sail south down the east side of Hook Island to your night’s anchorage at Cateran Bay which has 5 mooring buoys map c29 page 206 100 Magic Miles. This anchorage is also another site for snorkeling, another swim with the fish, turtles and coral bommies or explore the hills above Cataran Bay. 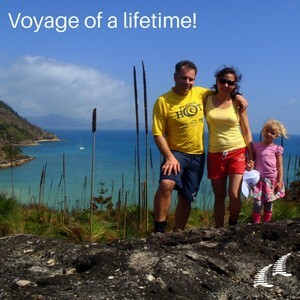 The Pletherbridge family went exploring on board Destiny and they told us their bareboating holiday was a "Voyage of a lifetime"! Read their trip report and get some tips from those who have been before. Always snorkel in buddie pairs! Its easy to get puffed out when snorkeling, so stay together.